“ ‘Well,’ said Rachel, ‘I like books, but I’m not crazy about book reports.’ ” Rachel, the protagonist of this “book report,” never said a truer word. It is certainly one thing to be a voracious reader, but to be a reader, critical thinker, and writer all at once truly is a remarkable thing. However, it must be said that the book report is easy if the book is a delight. And surely, Eleanor Estes’s Pinky Pye is one such book. 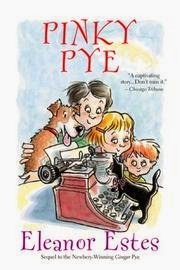 This story of the Pye family- a happy bunch consisting of Papa (an ornithologist), Mama, Jerry, Rachel, four-year old Uncle Bennie, along with their pets Ginger the dog and Gracie the cat- begins with a journey to Fire Island, a “long and skinny island just south of Long Island, which is also a long and skinny island, though it is fatter than Fire Island and much longer.” (A description borrowed from the book). The book is a chronology of the Pye’s adventuresome summer vacation. Much like the Middle Moffat, this book is a series of snapshots that string together to make for a lovely, lazy summer novel. Among the many wild and wonderful things that happen to the Pyes on Fire Island is the acquistion of a new member of the family: a charming kitten named Pinky. By the end of the book, Pinky is not the only new member of the Pye family, but I suppose if you would like to know about that, you will have to read the book for yourself. It is no wonder that Eleanor Estes is a Newberry award-winning author. Her energetic style, loveable characters, and interesting subjects lend themselves to an ideal children’s novel. However, there is a little something for everyone in this lively tale (it had my fiancé laughing out loud while I read it to him on our road trip- even begging for more, though my voice was rather hoarse). A few words here and there may be a bit archaic (what 9-year old do you know that frequently uses the word “cunning” to describe her pets?) and Estes descriptive narration often lends itself to long (borderline run-on) sentences with lots of odd punctuation that make for a somewhat difficult read-aloud. Nevertheless, I highly recommend this book to children of all ages (yes, that includes adults). 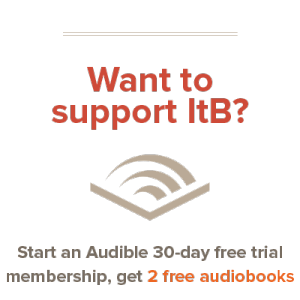 Buy Pinky Pye on Amazon and Support ItB! Next Post:Brave New World Previous Post:Giveaway Winner!